ISIS ammunition study: Missouri, China, among ultimate sources. 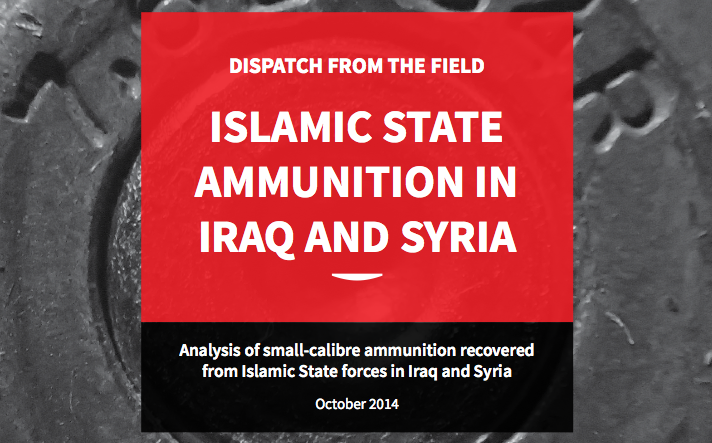 Study of ISIS Ammunition Finds 20 Percent of Cartridges Were Manufactured in U.S. CAR documented ammunition manufactured in 21 countries, with dates of production ranging from 1945 to 2014. Two production periods, the 1970s–80s and the 2000s, are most represented in the sample and primarily consist of ammunition manufactured in China, Serbia, Soviet Union/Russian Federation, and the US. It’s not surprising that ISIS is using American ammo, as the group is known to have seized weapons that were given to the Iraqi military by the U.S. But as America begins arming yet another group of Middle Eastern militants (Syrian rebels, to be specific), it’s a reminder of how quickly the work of the Lake City Army Ammunition Plant in Missouri—to take one example from the report—can end up in the hands of hostile forces.